Prolotherapy has been around for quite a long time, as an alternative treatment for damaged body tissues and musculoskeletal pain. The word ‘prolotherapy’ means ‘proliferation therapy’, and the treatment is also called ‘regenerative injection therapy’. It is based on the concept of creating artificial irritation or injury to stimulate healing, and is performed by injecting a non-active irritant solution to particular regions of the body, usually tendons or ligaments. 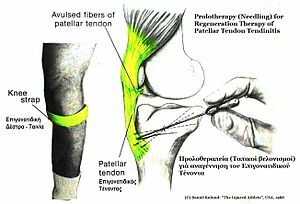 Despite the abundance of disputes and controversies regarding the effectiveness of prolotherapy, it is certainly becoming popular as a remedy for several conditions where usual medication and surgeries are helpless. In fact, the origin of the concept behind prolotherapy runs back to Roman times, where injured gladiators were ‘treated’ by poking hot needles into their shoulders. Later it was used for treating horses, under the name ‘needling’. However, George Hacket was the father of modern day prolotherapy which originated about six decades ago. Dr. Hemwall, who joined Hacket in the 1950s, is considered an expert in the field, having treated and studied more than 8,000 patients. Prolotherapy injections are used on connective tissue, weakened or damaged due to injury or strain. The sugar dextrose is commonly used, in addition to the common anesthetic lidocaine, phenol, cod liver oil and glycerine. Proponents claim that these substances can re-initiate inflammatory signals from unhealed or partially healed tissue, thereby enabling quicker recovery. Joints that fail self-resolution, recurrent swelling of joints or muscles, grinding or clicking joints, aching or burning pain and recurrent face, jaw or ear pain are some symptoms suggesting prolotherapy. The treatment is also recommended in case of spine pain whose origin is either unknown or non-responsive to surgery. Despite being useful in many cases, prolotherapy can completely fail in some cases. This is quite natural because prolotherapy can only boost natural healing. Nevertheless, many opponents of the treatment are collecting evidence to consolidate the concept of ‘prolotherapy scam’. Unfortunately, there are some undeniable risks of prolotherapy such as nerve damage, spinal headaches, bleeding and infections. In a study concerning 500 patients, five suffered from permanent nerve damage while 69 had to be hospitalized due to various complexities. Common side effects include pain after the procedure, stiffness and bruising at the injection site. Complications are especially severe in neck and spinal regions, just as in case of spinal injections, chiefly because those regions are quite delicate. Meanwhile, prolotherapy has also failed to establish itself as an effective monotherapy against chronic low-back pain. Another drawback of prolotherapy is that it is not covered by several major medical insurance policies, although some policy reviews have also been considered upon the demand from practitioners. Regardless of criticism and controversy, however, prolotherapy is still a better alternative for expensive and risky surgery, especially in case of spinal defects. Besides, many studies have shown that adverse side effects are quite rare and the treatment can generally be considered safe. Nevertheless, it is essential to conduct a full risk-benefit analysis before undergoing this type of treatment, not to mention extensive medical advice.